Today in Masonic History George Edward Pickett passes away in 1875. George Edward Pickett was an American soldier and confederate general. Pickett was born on January 16th, 1825 in Richmond, Virginia. He went to Springfield, Illinois to study law but by the age of 17 he had been appointed to the United States Military Academy at West Point. He was a popular cadet at West Point and often was pulling pranks. It was noted that despite his ability he did only enough to get by. He stayed at West Point and eventually graduated last in his class. This position is often referred to as "the goat." It symbolizes that despite the obstacles the cadet has stuck with it and made it through the academy. Pickett's early military career saw him in service during the Mexican-American war. During the battle of Chapultepec, Pickett distinguished himself when one of his fellow soldiers was wounded while carrying the American colors. He took the colors and fought his way to the roof of the palace where he unfurled the flag and announced the surrender of the fortress. Later he would head west ending up in the Washington Territories. There he was involved in what is known as the Pig War. American farmers and the British Hudson Bay Company were both present on the island of San Juan between Canada and the Untied States. When a pig owned by the Hudson Bay Company continually broke into an American farmers garden, the farmer shot the pig. Despite offering to pay fair market value for the pig, the Hudson Bay Company demanded that the farmer face British justice for the crime. This led to Pickett and his unit, which he was in command of, to be stationed on the island. In response the British sent three frigates and 1,000 men to the island. Pickett's unit was only 68 men. Despite the lopsided numbers, Pickett stood his ground and eventually both sides backed down. Neither side wanting to go to war over a pig. 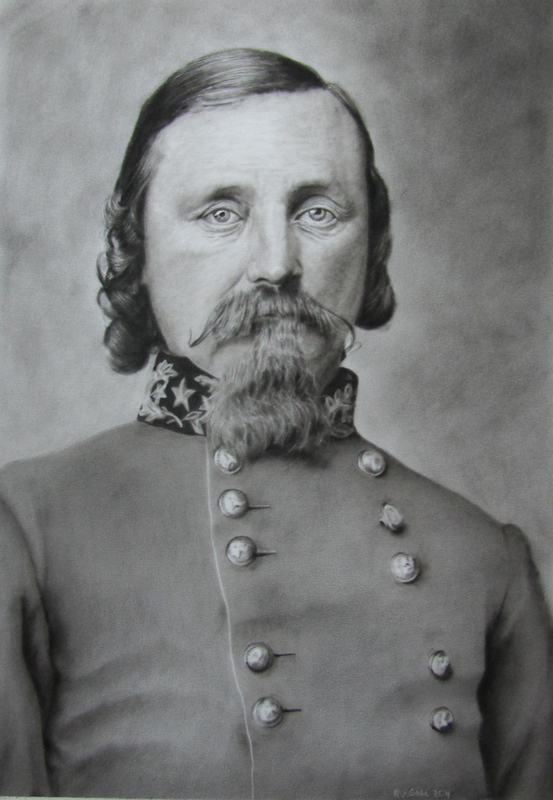 In 1861, after the start of the Civil War, Pickett resigned his commission in the United States Army and was made a colonel in the Confederate States Army. Before long he was made a brigadier general. Pickett was involved in a variety of battles leading up to the Battle of Gettysburg and was at least one occasion seriously wounded. At the Battle of Gettysburg, the now famous Pickett's Charge occurred. Although the charge bares his name, Pickett was actually not the senior officer on the field that day and was not in charge of the events. It is believed that Virginia newspapers hoping to inflate Pickett's importance in the events were the ones who named it Pickett's Charge. During the battle approximately 50% of Pickett's unit was either killed, wounded, captured or missing. General Robert E. Lee after the charge, in fear of a Union counter offensive ordered Pickett to reform his division, to which Pickett replied "General Lee, I have no division." After the battle Lee asked Pickett to write a post battle report. It was allegedly so bleak and bitter that Lee told Pickett to re-write the report. Pickett never re-wrote the report. Prior to the end of the war, Pickett captured 22 men who had deserted the Confederate Army and joined the Union Army. Pickett had the men executed. On April 9th, 1865, Pickett was with Lee when he surrendered at Appomattox Courthouse. After the war, Pickett fled to Canada when it was announced that there was going to be an investigation into the execution of the 22 men who were alleged deserters. After a year he returned to the United States when Ulysses S. Grant said the investigation was going to be closed. In 1874 House Resolution 3086, an "act to remove the political disabilities of George E. Pickett of Virginia", was passed and Pickett received a full pardon. Pickett was married three times. His third wife was LaSalle "Sallie" Pickett. She was 20 years his junior and outlived him by more than 50 years. Sallie published several books about her late husband and it is believed that she is the one who has turned Pickett into the larger than life character that is popularized. Among some of the claims were that Lincoln was the one that appointed Pickett to West Point. This was not true, it was actually a friend of the family that did that, although it was Lincoln's law partner. Another claim that most historians say is not based in fact is that after the war Lincoln paid a visit to the Pickett home and that Sallie greeted the President and even held one of the Pickett children who was an infant at the time. There is no evidence to back this claim. Pickett passed away on July 30th, 1875 of liver abscess. Until the time of his death, Pickett was often asked why he thought Pickett's charge failed, Pickett would respond, "I've always thought the Yankees had something to do with it." Pickett was a member of Dove Lodge No. 51 in Richmond, Virginia. It is also believed that he was a member of a military lodge called Old Guard Lodge No. 211 which existed during the Civil War. He was also a member of St. Alban's Chapter Royal Arch Masons and Richmond Commandery No. 2, Knights Templar.